Wet sanding, weird patches, see pics! Discussion in 'Luthier's Guitar & Bass Technical Discussion' started by shihku, May 2, 2016. Hey I'm working on a project gtr, I'm doing wet sanding and buffing atm. As this is my first attempt, I have some question regarding how properly wet sanded finish should look like. I'm using 800 grit at the moment, and I can't seem to get the surface of the guitar too look all of the same. There are some dull and shinny spots, rings, that I can't seem to remove. I just want to know if I'm on the right track before I **** things up. Pls refer to attached img. I generally like to keep going until all of the shiny spots are gone. The shiny areas are low spots in the finish that your wet sanding has not reached yet. Once you knock the high spots down until they meet the low spots, you should have an dull, even looking finish all over. Then you want to continue with the higher grits. I forgot to ask, what are you using as a sanding block? I can't see the image? i'm not using any hand blocks, just by hand, in circular motion, is this the right way to do it? got an email I can send some pics? No. It is imperative you use a block or similar to keep the surface flat. You hand pressure on sand paper alone will cause high and low spots. For small surfaces, I use a pink pearl eraser wrapped in sand paper. For larger areas a sponge, or a block of wood with foam or cork on it. Maybe the size of a business card or a bit larger. It's a link to the TDPRI. You have to log in there to see it. 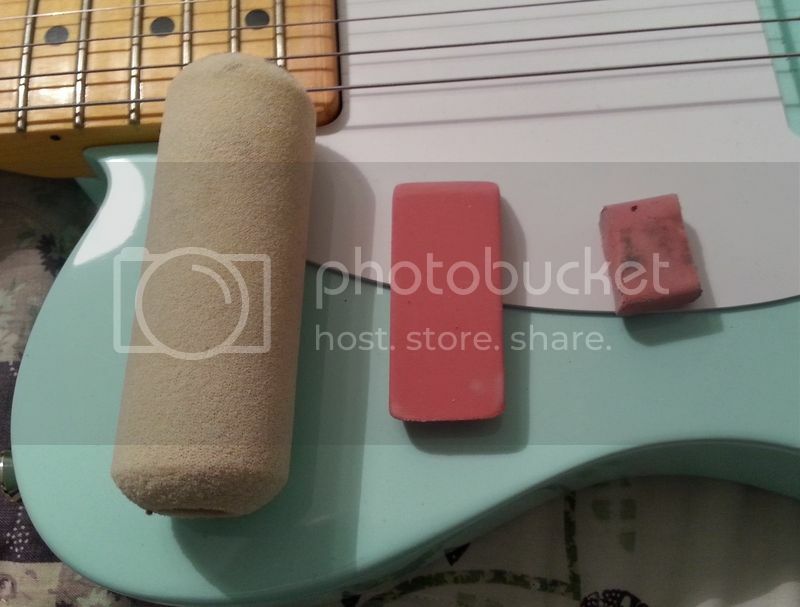 Erasers are the bees knees when it comes to small sanding blocks. Personally, I prefer Mars-Staedtler. I like them too, but when I can I prefer to use something more rigid, at least on flat surfaces. Vibrato bridge blocks make good sanding tools; I especially like 32mm Floyd Rose blocks since they're about the smallest around. You need a sanding 'block' and need to sand in straight lines. pic below are my sanding blocks. erasures and a foam tube thingy. Blocks need to be flat and light. If they are too heavy it will be easy to get a sand through. -wet sand using mineral oil or some kind of lubricant. The lubricant keeps the paper from clogging, and also helps reduce sand-throughs. Some use water (or water +a little detergent) but I dont because water can get into holes. I use baby oil/mineral oil because its easy to control where it goes. little diamonds in the finish. Also, you can feel any rough spots with your fingers. You are done when everything is dull and flat. Your next goal is to remove scratches left by the 800 paper. -wet sand in the opposite direction with 1000. You sand in straight lines but at a 90 degree angle to the previous sand. This helps you see any spots you may have missed. -repeat with 1500, and 2000. Keep alternating directions but always in a straight line. Pls have a look at the pics? I don't think I have sanded through the clear because I have not seen any black paint residue after wiping down. I will try that, but the ring shaped marks won't be from uneven pressure could it?? I think I have indeed sanded through the finish, as I'm seeing dark residue after wiping. 1. I can't get a hold of nitro here in Shanghai, are there any replacements? 2. Which area should I apply the clear? Possibly just the area that had being sanded through? 3. I don't need this to look amazing, just good enough. I really don't have time to do this anymore. I suspect the guitar was finished with some sort of polyurethane finish, and you were chasing witness lines....probably until you sanded through the finish. If you want to keep it simple, finish it with shellac. It's actually a very good finish, and it's compatible with practically every other finish. It dries fast and is very forgiving. Put it on in very thin coats, light level sanding, buff and done. I ordered this from the States, not super happy about it. When I got it had marks over the headstock and body from the wrapping paper as the paint hasn't cured yet. It has been 3-4 month and the smell is still there. I requested it to be finished in nitro but who knows?! Would it be okay to paint shellac over nitro? Thanks! Yep. Shellac over nitro is fine. If you change your mind later, you can go right over the shellac with practically any finish you wish, or simply wipe it off with alcohol. It's a very user friendly finish and you can get some really great results. Since you can't get nitro, I'd certainly give it a try. Fool around on some scrap first. 1. The ring shaped marks, how do I go about removing them? I was trying to sand it away, but finally sanded through the clear. Could this be a problem with the paint itself? 2. To apply Shellac, would it be feasible to just coat the problematic area? Would clear nail polish be an alternative? I can't tell just from the photos exactly what you're seeing. I assumed they were witness lines. That's still kind of what it looks like to me. Regardless, all of those sins should disappear as soon as you put a new topcoat of something on it. That would be my assumption. Nitro would be ideal, but since you can't get it your choices are kind of limited, at least for an easy to apply finish. That's why I suggested shellac. You wanted easy and fast. It doesn't get much easier or faster than that. Spray the entire body, 2 or 3 coats a day, for a couple of days. Let it sit a week. Level it, and gently buff it to whatever sheen you want it. Incidentally, I wouldn't wet sand shellac. Just dry sand it to 600...maybe 1000 if you really want to go nuts. Then polish it with a decent polishing compound. It appears that you have gone right thru the clear in varying degrees and yep, a new clear coat is probably the best way to remedy. It would be good to find out what's on there. In the absence of perfect information you can test candidate remedies in the cavities or under the pickguard. Good Luck! I'm told its It re-ranch guitar nitro, except for a thin layer of a "universal" sparkle. So I may have sanded through the sparkle, how would I go about fixing the situation? To make the ring mark go away?